Alpine Adventure - Repost of Stampin' Up! FB page. Note: this is repost of a FB note post that first appeared on Stampin’ Up!’s facebook page on October 11th. Hello friends! Are you ready to go on a little adventure ... an Alpine Adventure? I had a blast playing around with the wintery images in this stamp set with the Stamparatus and am excited to share a few ideas with you. 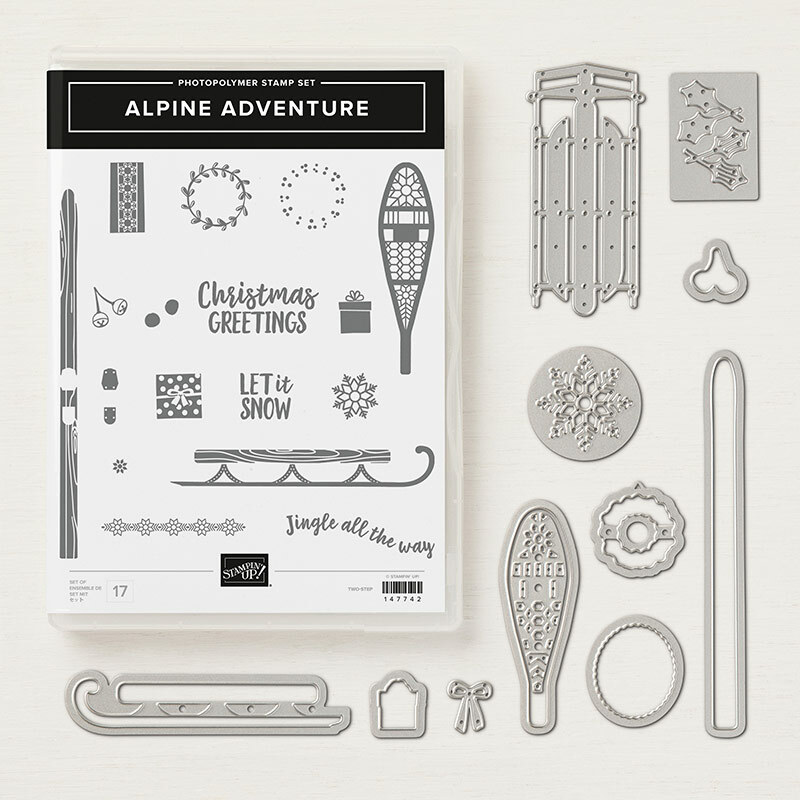 I’m a big fan of winter sports so I was thrilled to see the Alpine Adventure Photopolymer Bundle (item 149919)in the Holiday catalog. The bundle includes 17 stamp images and 12 dies. Creating this perfectly repeating snowshoe background was a breeze using the Stamparatus (item 146276). The snowshoe stamp image is the perfect size to repeat using the hinge step. The snowshoe has been stamped in Gray Granite Classic ink(item 147118) onto a piece of Gray Granite cardstock (item 146983). Stamp one row of snowshoes with the snowshoe faced up (ink image, stamp, move hinge). Then align the snowshoe stamp in the open area upside down to create the second row (ink image, stamp, move hinge). Continue this process until the entire sheet is covered with snowshoes. This bundle is full of great support images. I added a couple of die cut snowflakes, jingle bells, a greeting and a bow. Then I layered the assembled card front onto a piece of Festive Farmhouse Designer Series Paper(item 147820) to finish the card. 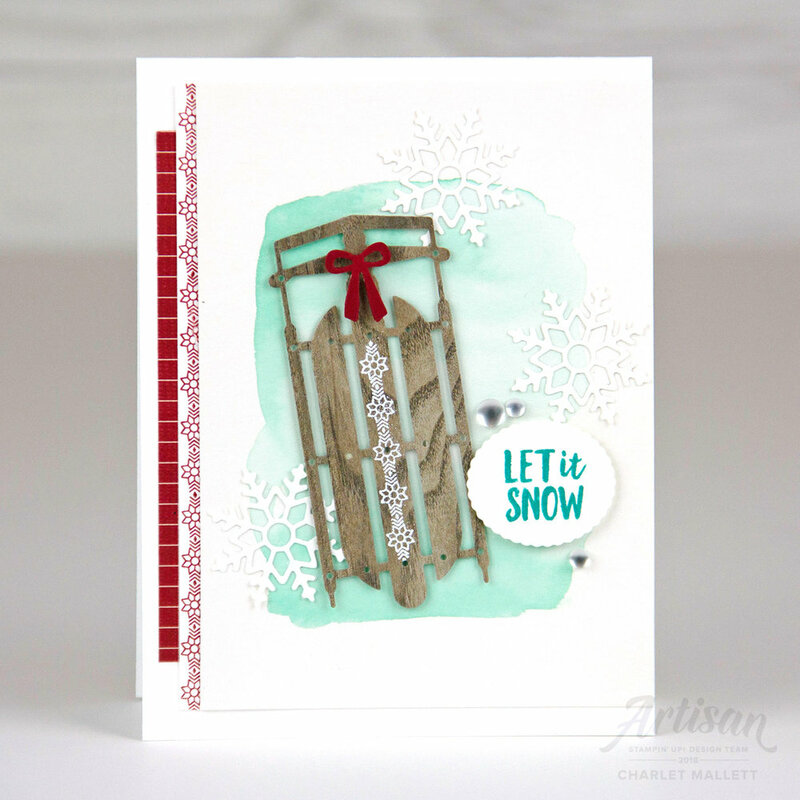 Here’s another card using the snowshoe to create a similar background. This time the snowshoe image has been stamped in Bermuda Bay Classic Ink(item 147096) on Whisper White Cardstock(item 100730). The greeting has been stamped in Cherry Cobbler Classic Ink (item 147083) and layered onto the background. This card also uses Cherry Cobbler 1/4" Double-Stitched Ribbon(item 144117), which I think coordinates perfectly with the designs this stamp set. Here are a few more cards showcasing this bundle. Hope you’ve enjoyed this little set sampler. It’s nice to have some winter play without the cold fingers and toes. Have a great day!